Minimum 32MB RAM, 12MB Disk Space, Sound Card. Play, deform and scratch your video (AVI,FLI), synchronized them with your sound or any sound source. features: lots of effects synced on sound, full screen video out, video capture, MIDI, sequencer, plug-ins architecture. Posted by typlan on Thu, 08/29/2002 - 15:04.
there s no virus on the aestesis site ! it is on your machine ! 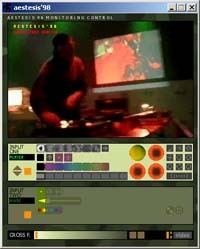 btw : go directly to www.aestesis.org , to get the new elektronika version !! Virus,. Ghost!! Don't open it!! Posted by philip on Wed, 06/13/2001 - 09:01. Pls. do not open this file!!! I'd downloaded this .exe file and after I opened it, a JAPANESE GHOST FACE pops up a few sec. and then it hide, and then it will pop up again!!! Posted by Shruti, it's for you! on Mon, 03/29/2004 - 10:12. I'd downloaded this .exe file specially for you. Re: Virus,. Ghost!! Don't open it!! Posted by andy on Wed, 07/03/2002 - 05:14.
: Pls. do not open this file!!! : I'd downloaded this .exe file and after I opened it, a JAPANESE GHOST FACE pops up a few sec. and then it hide, and then it will pop up again!!! Posted by lisa on Mon, 03/25/2002 - 18:44. Posted by andy on Thu, 07/04/2002 - 05:51.
: : Pls. do not open this file!!! : : I'd downloaded this .exe file and after I opened it, a JAPANESE GHOST FACE pops up a few sec. and then it hide, and then it will pop up again!!! Posted by Niholos on Thu, 10/12/2000 - 04:50. Why don't you give newsletter through e-mail? Posted by wht on Thu, 06/08/2000 - 17:09. Posted by Stigger on Sun, 05/26/2002 - 02:09. Posted by Diogo on Sun, 05/26/2002 - 02:09. Posted by THÆM on Sun, 05/26/2002 - 02:03. Posted by zoio on Sat, 05/25/2002 - 18:56. Posted by gui on Sat, 05/25/2002 - 18:30. Posted by DJIncubus on Tue, 03/19/2002 - 20:37. Posted by thim on Sat, 05/25/2002 - 18:31. Posted by remzi eften on Wed, 08/01/2001 - 14:27. Posted by Mike Fragga on Tue, 03/28/2000 - 09:24. Posted by renan jegouzo on Mon, 02/12/2001 - 08:27.
no virus in this .exe file.